Construction projects are bigger, more expensive, more complex, and take longer than ever before. The construction industry is rapidly changing – a tipping point in the industry, if you will. Late last year, Forbes released an article describing the construction industry’s move toward utilizing technology. Because of the sheer number and size of construction projects, many firms are moving toward new technology to help them stay on track and gain a competitive advantage in the field. Real-Time Status Updates – Collaborating on a platform to update spreadsheets in real-time keeps all parties of a construction project on the same page at all times. Gone are the days of updating and emailing back and forth between those in the office and others working in the field. The archaic methods of yesteryear assist in project delays and poor decision-making. We’ve learned now that construction projects thrive with a collaborative effort between everyone involved. When office and remote employees have the same visibility on a project, productivity, transparency, and overall project results flourish. Stay On Track, Automatically – Delays are the bane of any construction project’s existence. But by automating project notifications, you could save up to six hours every week. Utilizing a work execution platform that provides automated alerts, tracks digital signatures, and updates project documentation keeps construction projects moving forward. The best technology in this area notifies project stakeholders when changes will affect their next task. Because one portion of a project often needs to be finished before the next one begins, it’s important for other team members know if schedule changes occur. Collaboration for All – Almost every single facet of a construction project is dependent on another aspect of the job. When team members work independently, delays occur and mistakes are made. By making a more collaborative workspace for all employees – from office workers to field workers – your construction project experiences its greatest productivity. A cloud-based platform can help to handle work management needs, as well as enable the collaboration between all parties on your construction project. Seeing the complete picture on a given project not only improves efficiency on that project, but on projects to come. Is Your Company Ready for a Technological Change? The construction industry is at a technological tipping point. Evolving with the times and leaving the archaic methods of the construction industry in the past helps your company grow, as well as complete and manage more successful projects. From team collaborations to increased transparency and greater productivity, technology is the key to more consistent projects. 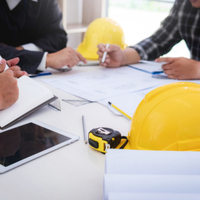 For information about how DrawAlert can save you time and money on your next construction project, contact us today.